Golden Gate Park is one of the best things about San Francisco. You could spend a week here and not see and do everything! 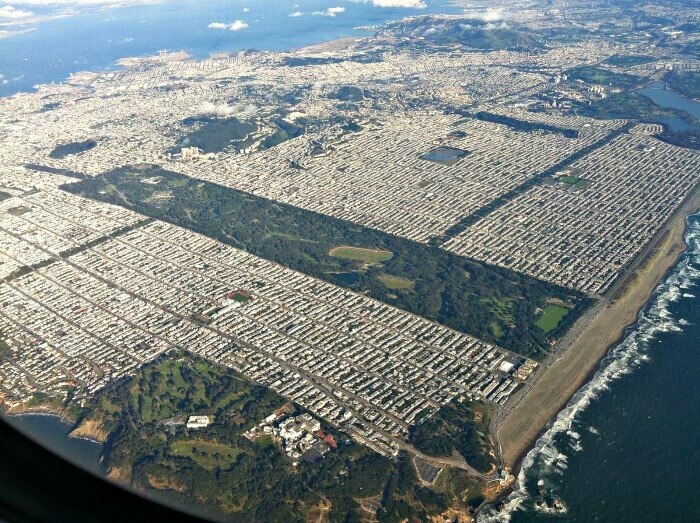 Golden Gate Park is larger than Central Park in NYC, stretching from the center of the city, in the Haight-Ashbury neighborhood, all the way out to the western edge at Ocean Beach. There's something for everyone here: world-class art and science museums, the Japanese Tea Garden, botanical gardens and lakes to go boating on. Plus miles of walking and biking trails. 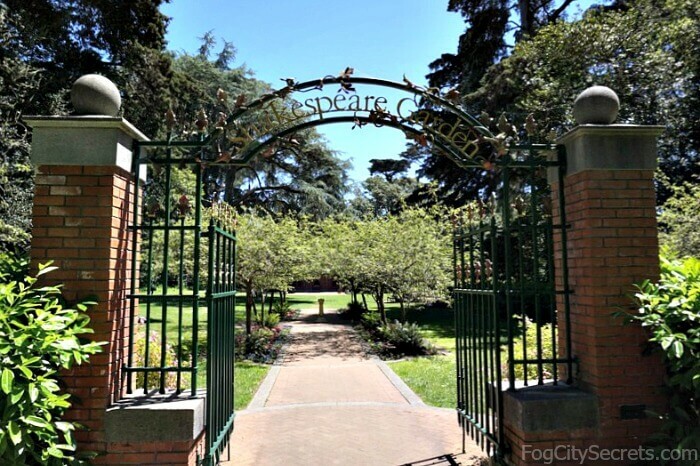 Some of the best things are tucked away and not well-known except to locals, like the imaginative Koret Children's Playground and carousel, Portals of the Past "ruin", Stow Lake, the Shakespeare Garden and the Beach Chalet. 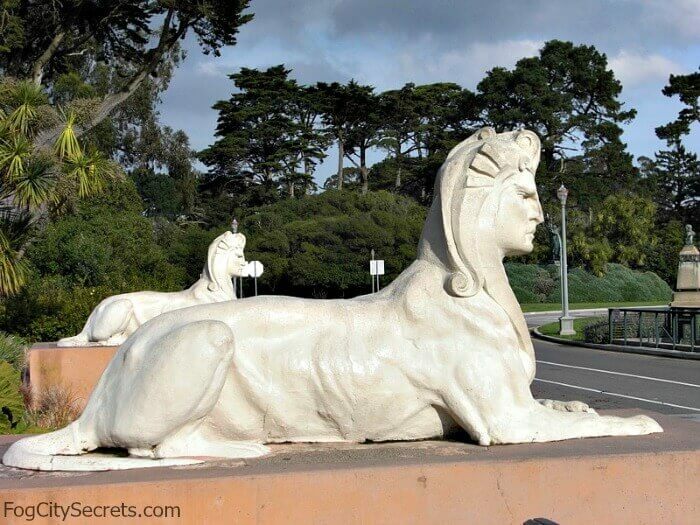 Golden Gate Park is three miles long, one half a mile wide and has over 1000 acres of grounds. Locals love this park, and there's a lot here for visitors to enjoy. But how to approach such a massive list of things to see and do? The Main Attractions: if you only have a day or part of a day to spend in the park. Fun Activities: cool things to do in the park. The Extras: fun things to explore if you've got more time. 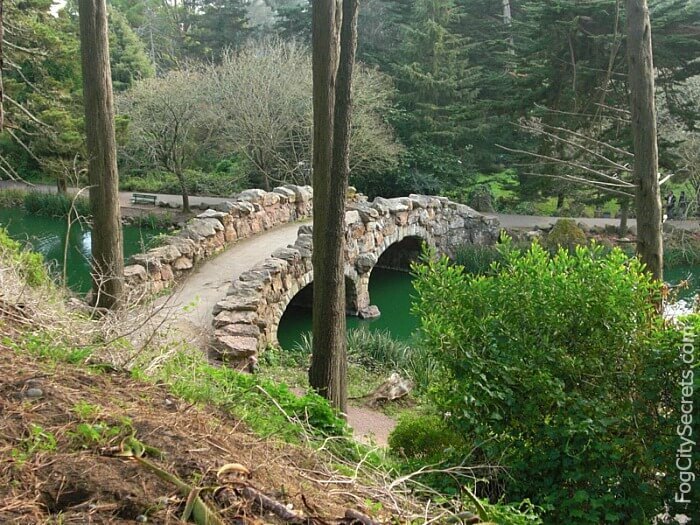 If you have just a brief time to explore, here are some of the best things to see in Golden Gate Park. The California Academy of Sciences is San Francisco's premier science museum. Explore the four-level Rainforest, the Steinhart Aquarium, and state-of-the-art Planetarium. Check out the Living Roof, too. 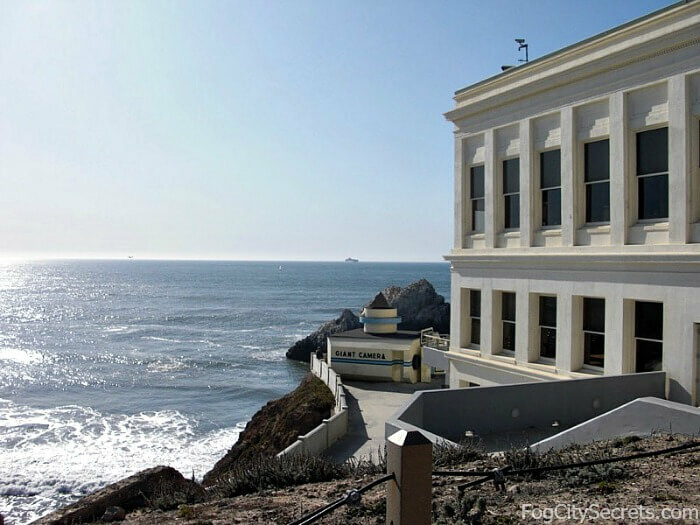 See Academy of Sciences for more info and tips for visiting. 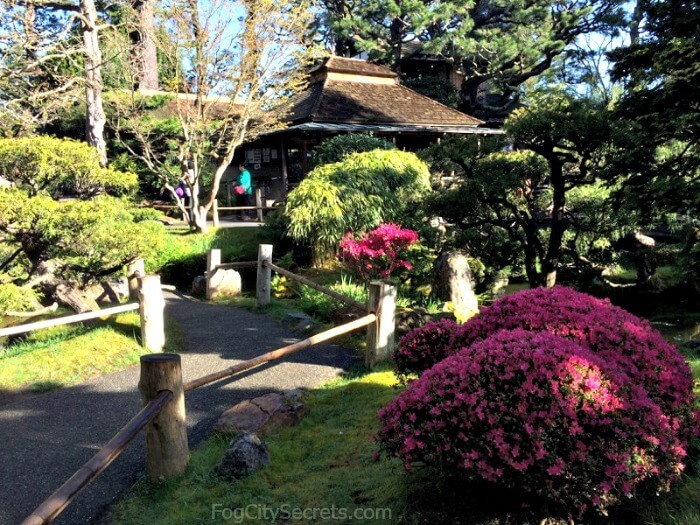 The Japanese Tea Garden is a favorite spot. Beautiful, peaceful paths over pools and past pagodas, with Japanese refreshments at the Tea House to finish off. More info on visiting the Tea Garden. 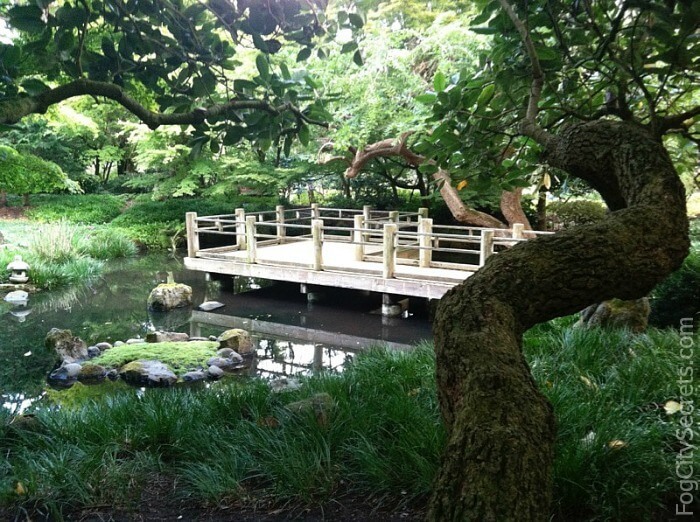 San Francisco's Botanical Garden has 50 acres of green loveliness. Wander through the Prehistoric Plants Garden, wax poetic in the Moon Viewing Garden or inhale the Fragrance Garden. See Botanical Garden for photos and info on everything to see here. 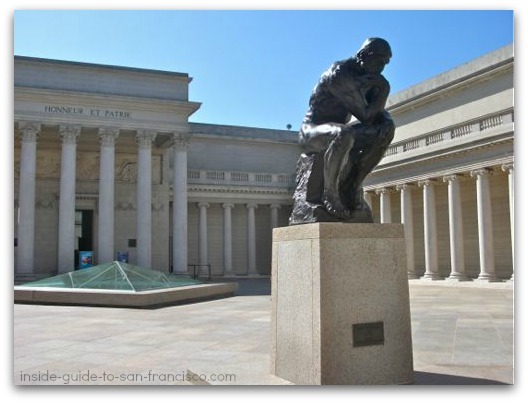 The de Young Museum has an enormous art collection, from 19th Century paintings, abstract art, African masks, pre-Columbian pottery, and special traveling exhibits like King Tut or the Impressionists. Find out what's at the de Young. The Conservatory of Flowers takes you back to the Victorian era. Explore the rooms of orchids and carnivorous pitcher plants, plus the high altitude cloud forest and giant lily pond. 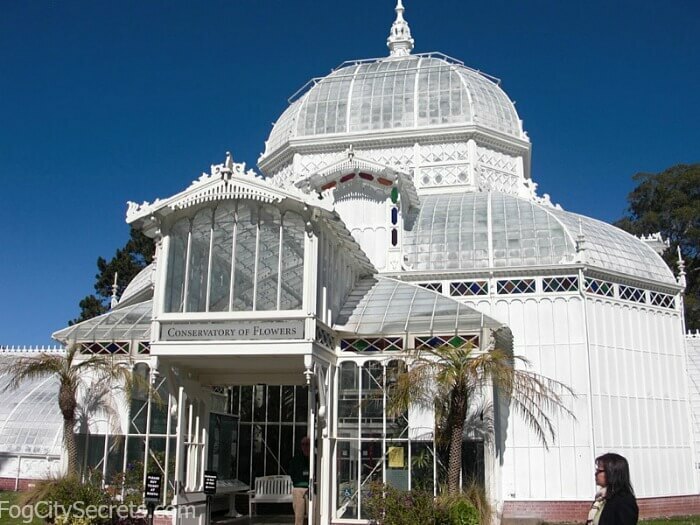 See Conservatory of Flowers for details and visiting info. Stow Lake is a big favorite of the locals. Charming, man-made lake with waterfalls and a Chinese Temple, with pleasant walking trails and boats to rent. Climb Strawberry Hill in the center to see views of SF and the bridge. 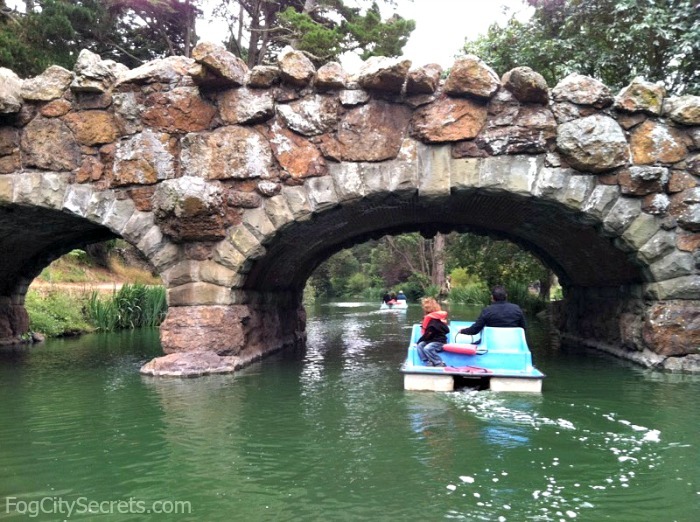 More on Stow Lake: tips for visiting and renting the boats. 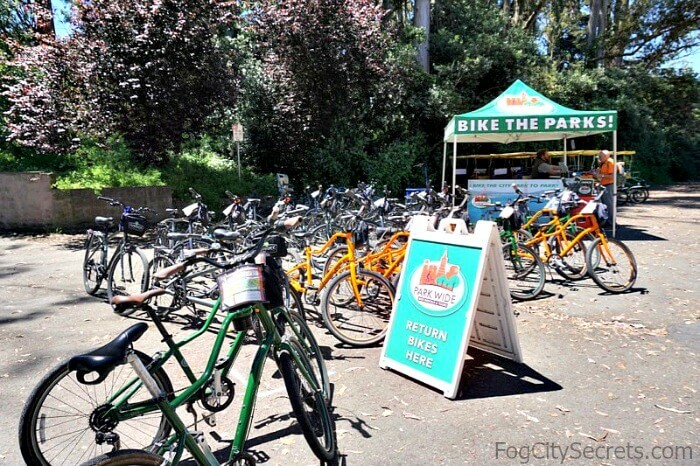 Golden Gate Park is a great place to ride a bike; there are miles of trails, paved and not, winding through attractive scenery and past the park's numerous attractions. Renting bikes. There are four options for bike rentals in the park. Golden Gate Park Bike and Skate. 3038 Fulton St, at 7th Ave.
Parkwide Bike Rentals and Tours. 2 park locations (see below). Bay City Bike Rentals and Tours. 1669 Haight Street. Golden Gate Tours and Bike Rentals. 1816 Haight Street. This bike and rollerblade rental shop has been a local fixture for decades. This is a local business that has been providing bicycles and roller skates/rollerblades for people to use in the park at a convenient location on Fulton Street at 7th Avenue (3038 Fulton Street). It's just across the street from the park and close to major attractions like the de Young Museum, Academy of Sciences, Tea Garden and Conservatory of Flowers. This is a friendly, family business; I used to rent skates from them when my son was young. They have the best rates for bike rentals. It's right across from one of the favorite biking and skating areas in the park: JFK Drive, the stretch between Transverse Drive and Kezar Drive, which is closed to cars on Saturdays and Sundays all summer (April through September) and on Sundays all year round. Skater Dance Party: it's also near an area that skaters like to gather and skate to music, or just learn to skate. That area is off Fulton directly across from 6th Ave. See Orange Dot on map above. Parkwide rents bikes, at two park locations. One is just behind the band shell on the Music Concourse, between the Academy of Sciences and the de Young Museum. Their other park bike rental office is at 1669 Haight Street, two blocks from the park. Parkwide does bike rentals at 5 locations in the city, plus has guided bike tours available for the park and other areas of the city. They have surreys and tandem bikes for rent as well. Note on the surreys: they are really cool, but are heavy going on hills. The park is fairly flat, but even slight hills are a lot of work in a surrey! No gears. The flattest route is along JFK Drive past the de Young Museum and Conservatory of Flowers; easy access from the Bandshell. They come in two and four-person versions. Bay City Bikes also does bike rentals and guided tours of the park. 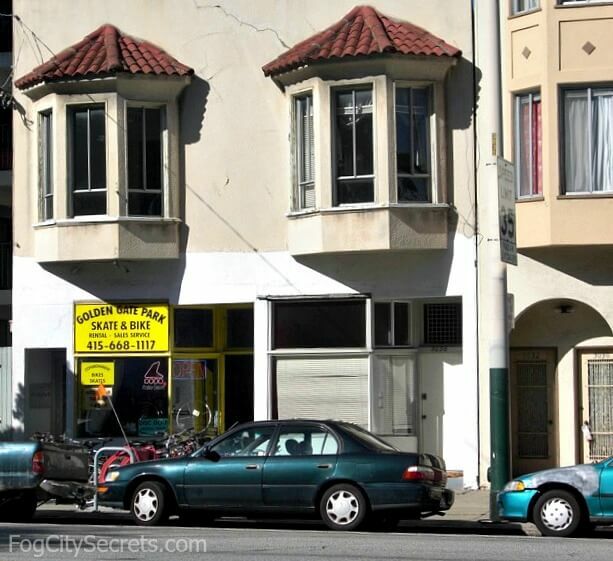 Their office is at the same location as Parkwide, at 1669 Haight Street. Golden Gate Bikes rents bikes (but doesn't do guided tours). They're right next to the park, between Stanyan and Schrader. 1816 Haight Street. All four businesses have tandem bikes, kids bikes, and trailers for rent. Parkwide has surreys for rent, and Golden Gate has skates and disc golf items for rent or purchase. Golden Gate Tours and Bike Rentals's all day rental is 20% off if booked online. Bay City Bike's all day rental is 20% off if booked online. Parkwide's all day rental is 10% off booked online. Groupon sometimes has 45% off an upgraded bike from Bay City Bike ($22 for the $40 bike rental) - check for availability. 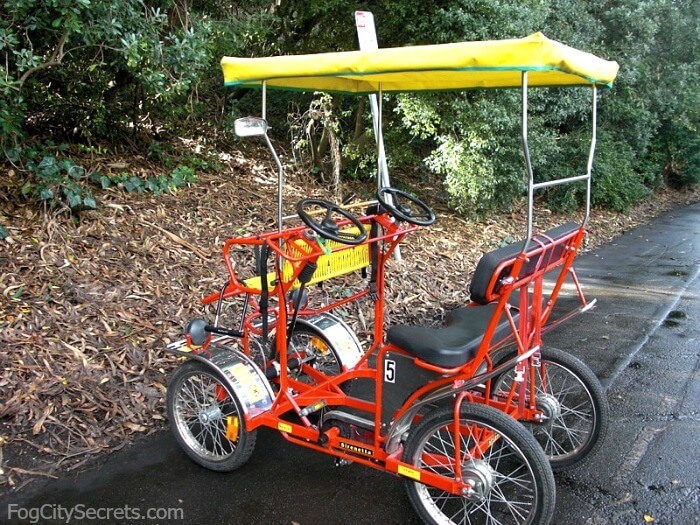 For bike tours of Golden Gate Park, see below. There's a large archery range in the park, free to use, and maintained by a local club. It's just off Fulton Street where 47th Avenue enters the park. The range is open for the public to use during the day, seven days a week. If you don't have the equipment, there is an archery store nearby that will rent you the bows and arrows and other equipment, and give you a ten minute quickie course in using the equipment. Very nice people. SF Archery Pro Shop. 3795 Balboa Street. 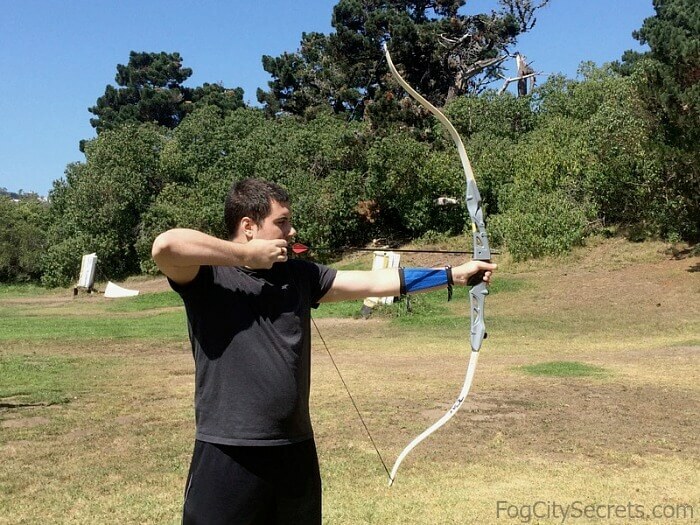 For more info on the archery range, and other archery classes, see SF Archery. 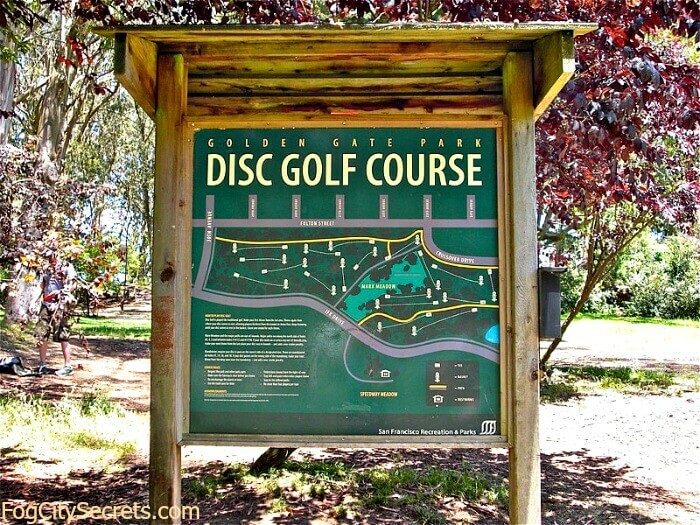 Golden Gate Park has a disc golf course tucked in amongst the trees (more challenging!). Another place to play in the park created and maintained by a local group. On JFK Drive. The bike rental shop at 3038 Fulton Street at 7th Ave rents and sells disc golf equipment. See my page on disc golf in the park, with info and pictures of the course. 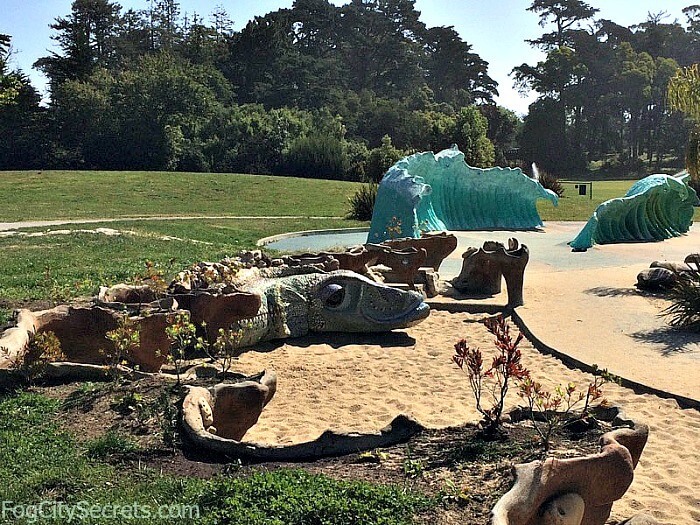 One of the most popular city playgrounds is in the eastern end of Golden Gate Park. It recently got a complete makeover, and has lots of fun play structures and fanciful elements. Fortunately, they kept the best feature of the old playground: the cement slides. Sized for kids, they aren't as steep and fast as the primo cement slides of Seward Street, but they are nice and long, and sufficiently fast for the little ones. 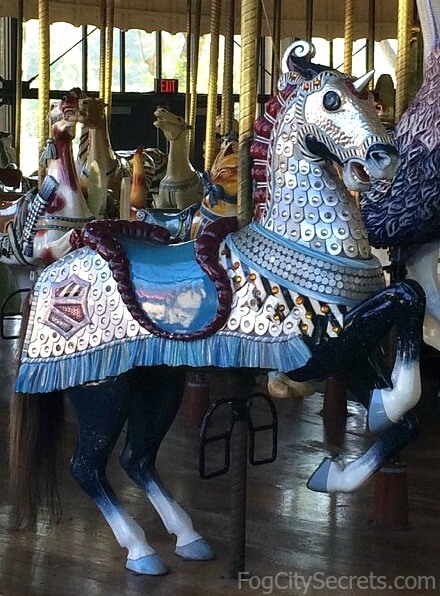 There is a wonderful carousel next to the playground, built in 1914, with beautifully-restored animals. Hop on a frog, a dragon, or maybe a rooster, for a turn on the merry-go-round, and check out the local scenes decorating the carousel. There is a place to do art in the attractive building next to the Carousel. The Sharon Art Studio has classes in painting, ceramics, jewelry-making, and more. All ages. See sharonartstudio.org for their list of classes and info. Every Sunday a group gathers off JFK Drive near the entrance to the Music Concourse area (near the de Young Museum). You can join in for free lessons in dancing the Lindy, a form of swing dancing. 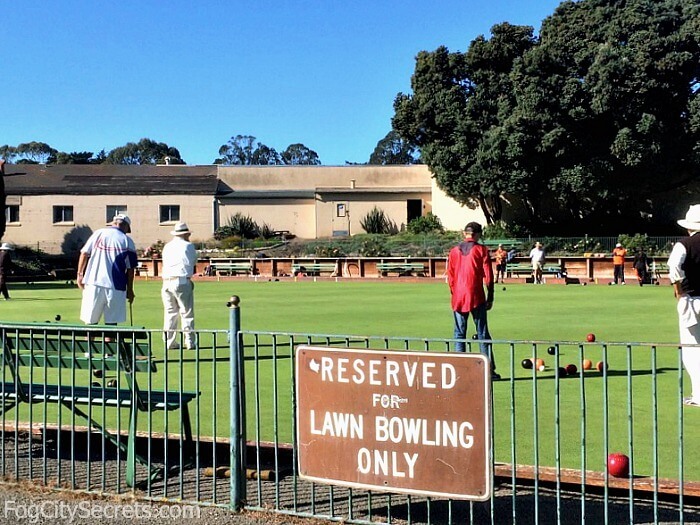 There's a lawn bowling court near the Children's Playground; the local club is active, and you'll often see them there in their white bowling outfits (or not). 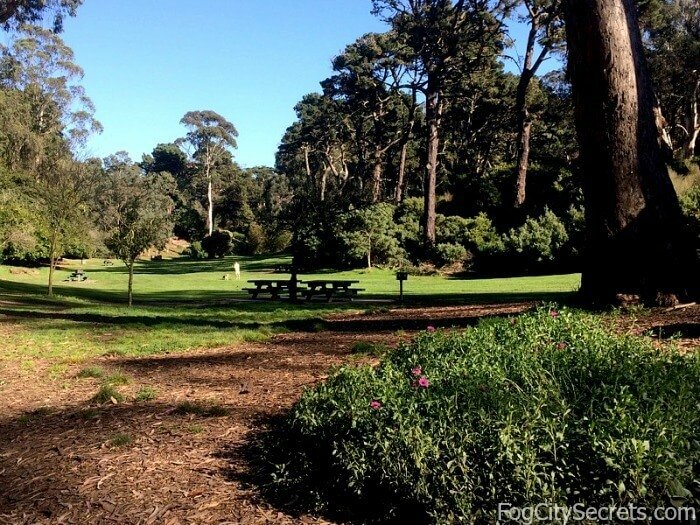 The Petanque courts are in another area, near the Dog Training Area, just west of Spreckels Lake. 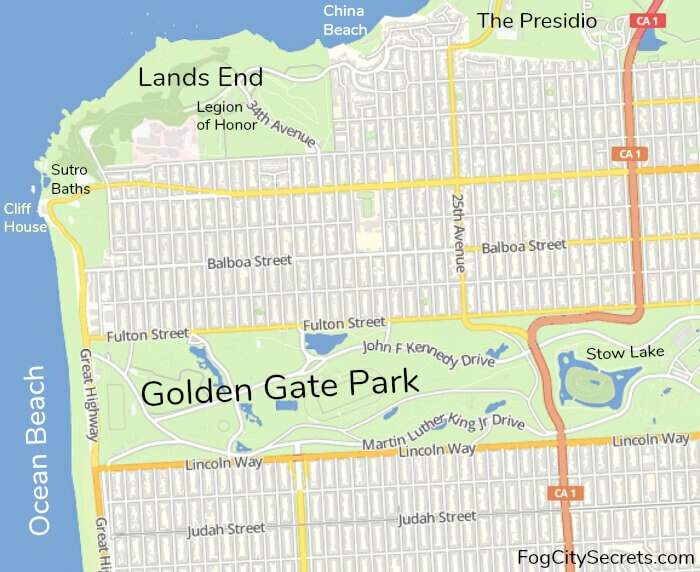 Golden Gate Park has 21 tennis courts for public use, located just off JFK Drive, across from the Conservatory of Flowers. The courts are open daily, 9 am to 4:30 pm, first-come, first-served. For weekends and holidays, you can reserve a court: call 415 831-6302, starting Wednesday at 4 pm, for the following weekend. You can also make reservations in person at the Tennis Complex office. Fees. Weekdays: $6 (SF residents $4); seniors 65+ $2; 18 and under free. Weekends and holidays: $6 (SF residents $5); seniors $5; youth $2. Fly Fishing in the Park? There are lots of odd little places in Golden Gate Park that surprise and delight the wanderer. 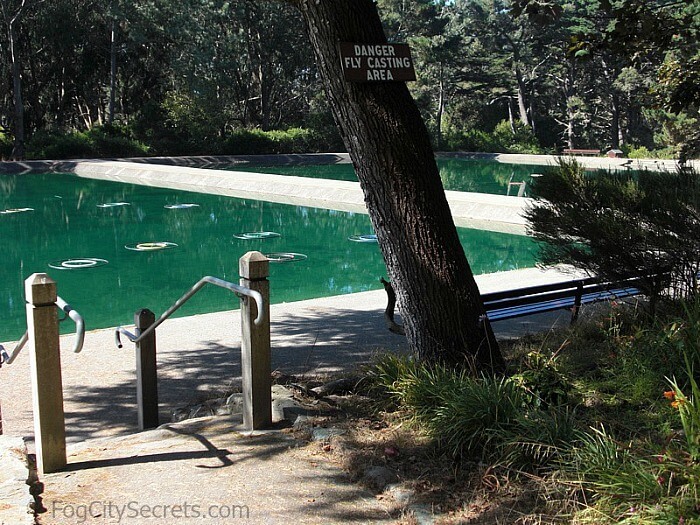 Golden Gate Park has casting pools set up to practice fly fishing. Not much used, but neat to have. They have their own little lodge, as well. Stow Lake is the place to rent boats. Choose a paddle boat, a rowboat or an electric boat, and sail around the lake. One leisurely trip around the island takes about an hour, and you can stop at the snack bar afterwards for burgers or hot dogs to revive you. 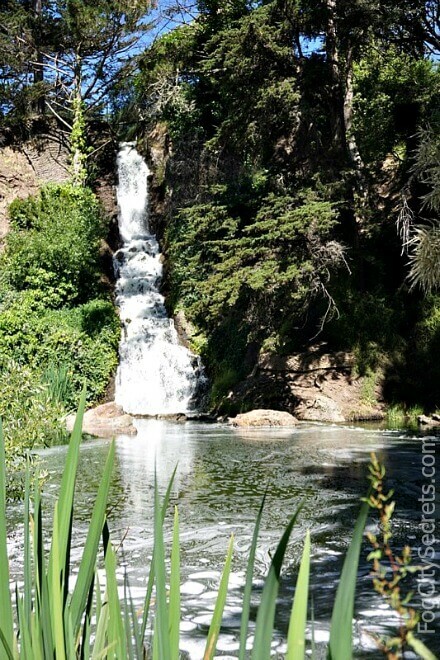 Stow Lake is also one of the best places for walking. Circle the island to admire the waterfall and Chinese Pavilion, or climb Strawberry Hill for the views. There plenty of free parking around the lake. 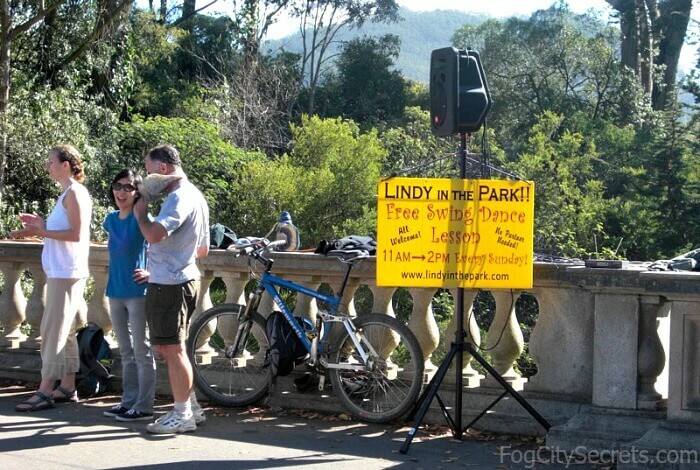 See more on Stow Lake, boat rental info, and how to get there. 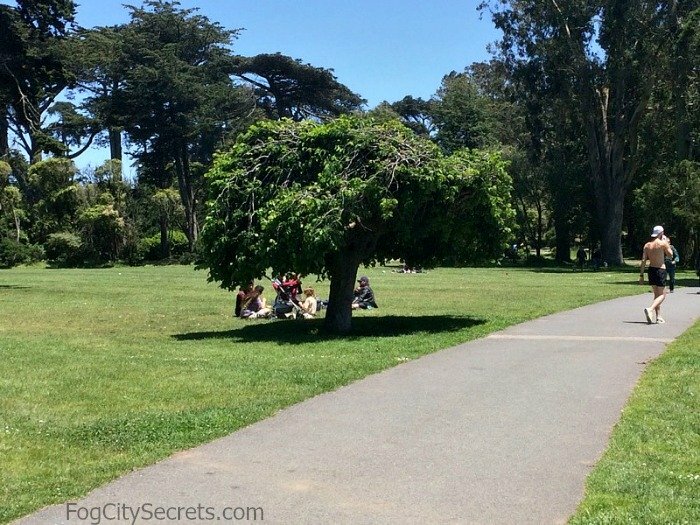 Golden Gate Park is a great place for picnics. Loads of pretty meadows surrounded by trees and flowers are found all through the park, and picnic tables are provided here and there. Many of the picnic areas have BBQ grills; or you can bring your own. 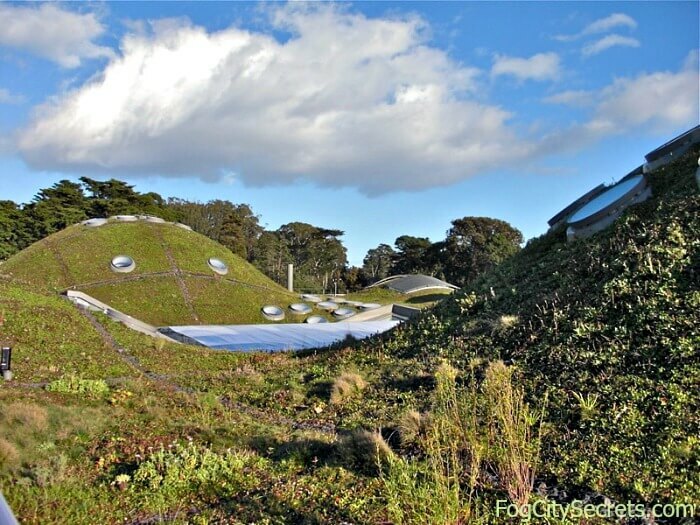 Every Sunday at 1:00 p.m, April 28 through October 6, 2019, the Golden Gate Park Band gives a free concert on the Music Concourse, the flat area between the Academy of Sciences and the de Young Museum. There are rows of chairs for spectators among the trees in front of the Band Shell at one end of the Concourse. Each concert has a different theme; the last one I watched was Big Band music, lots of fun. The concert starts with the National Anthem. See Golden Gate Park Band for the schedule. You can take a tour of the park as well, to get a good overview. Hop on Hop Off Bus: these convenient bus tours go all around the city and stop in the park near some of the main attractions (de Young Museum, Tea Garden, Academy of Sciences, Conservatory of Flowers). It's not really a tour of the park, but you do hear about the attractions you're passing. It's mainly useful for getting you there without a car, and back to the other areas of the city. See Hop on Hop Off Bus for booking and more info. City Sightseeing Mega Pass: this pass gives you the Hop On Hop Off bus tour, plus admission to various San Francisco attractions. 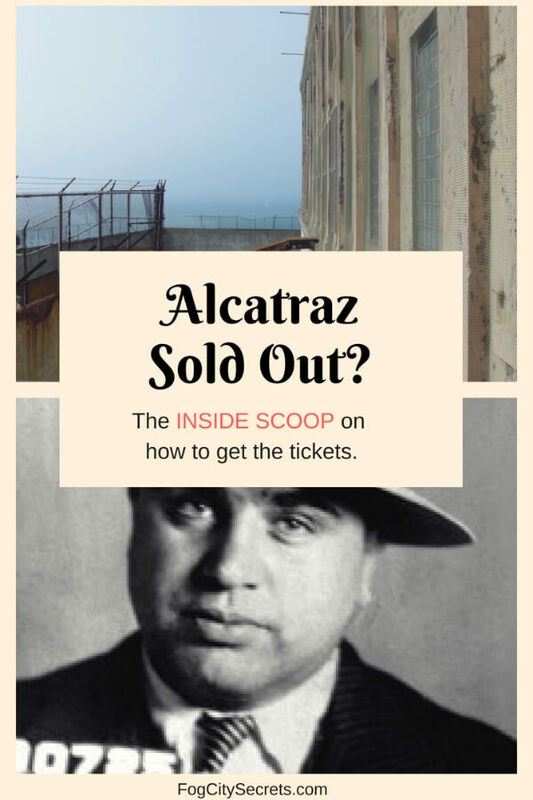 You pick several from a long list, including some of the Golden Gate Park attractions like the Academy of Sciences, de Young Museum, and bike rentals. See Mega Pass for more info and booking. Save $5 to book it online. 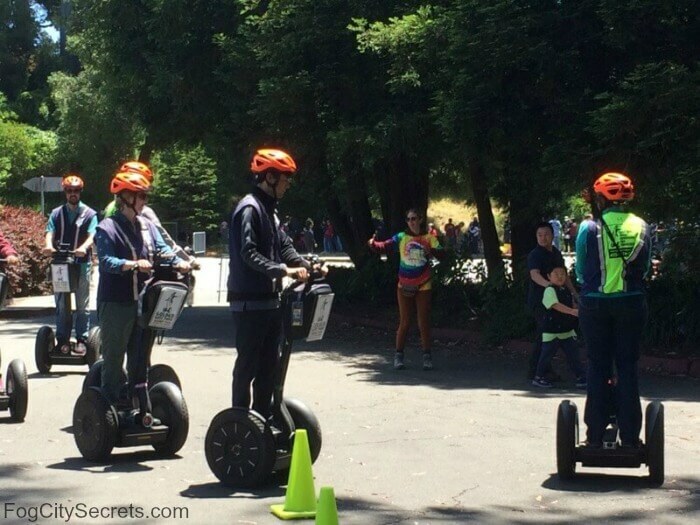 Segway Tour: this highly-rated tour takes you all over the park, explains the history, and lets you see lots of cool things. Fine for beginners and beyond (they do a 40 minute training session before you set out). Meet at the Segway kiosk behind the Band Shell on the Music Concourse (next to the Parkwide bike rentals marked on the map above). I've seen them whizzing around the park; looks like fun! See Segway Tours for booking and more info. Go Car Tours: zoom around the park (and the rest of the city, if you want), in the self-guided Go Car. You'll hear information about the attractions in your ear as you drive near them. Plus you can park anywhere, and get out and explore. For booking, see Go Car Tours ($2 off if booked online). Bike Tours: Parkwide Bike Rentals and Bay City Bike have guided bike tours of the park. 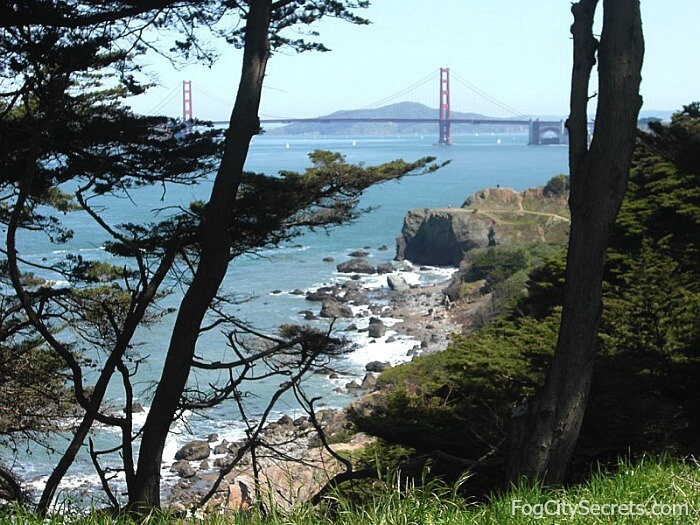 They go from the Haight Ashbury neighborhood at the eastern end of the park, all through the park, and out to the ocean. Both at 1669 Haight Street, 2 blocks from the park. See parkwide.com or baycitybike.com for more info. 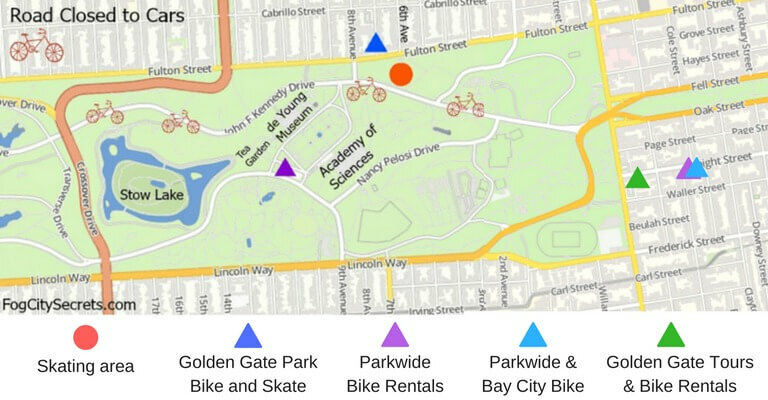 Parkwide, Bay City Bike and Golden Gate Rentals have self-guided bike tours as well. They send you off with a map with suggested tour routes on them. Very popular. See self-guided tours for info and booking. Sometimes Groupon has good deals like 45% off; check for availability. 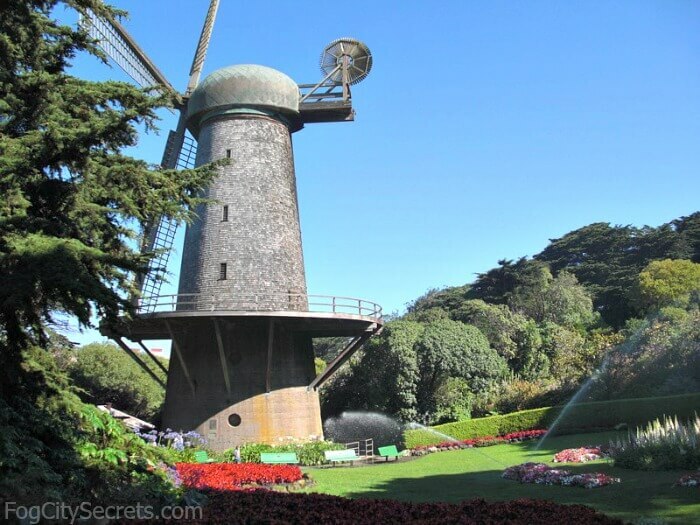 When Golden Gate Park was being created, two windmills were built on the western edge to pump water for irrigation. These windmills provided water for the plants in the western half of the park for its early years, until 1935, when electric pumps took over. The windmills pumped water up to the reservoir on top of Strawberry Hill at Stow Lake, and that water was used to irrigate the eastern side of the park. Excess water was released into Stow Lake via the waterfall by the Chinese Pavilion. Both windmills had fallen into serious disrepair by the 1950's, They stood at the edges of the park for many years in a raggedly condition, but were recently restored and are quite impressive to see now. The northern windmill was built in 1902 and was donated to the city by Queen Wilhelmina of the Netherlands. 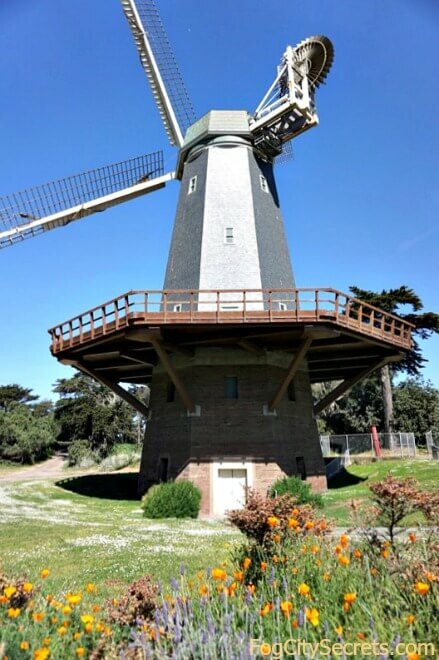 A beautiful garden has been planted at the base of the windmill, which displays masses of tulips in the early spring (February and March in SF), and other flowers the rest of the year. See more info on the Dutch Windmill and the Queen Wilhelmina Tulip Garden. The southern windmill was built in 1908 and is now decorative only. It's the largest windmill of its kind in the world. Murphy Windmill is the scene of the annual Dutch festival, King's Day, where you can join the Dutch community, wear orange (color of Dutch royalty, the House of Orange), eat and drink, play games and celebrate all things Dutch. Held at the end of April every year. See King's Day for the schedule. Of course the park itself is one big garden, and the Botanical Garden and Conservatory of Flowers have amazing collections, but there are also many unique gardens tucked here and there, which focus on a specific floral theme. These varied gardens are often placed off the well-worn paths, and are sweet spots for quiet contemplation and relaxation. I went through the park and found them all; most I had never seen before, in spite of living here many years. The Shakespeare Garden has over 200 of the flowers and plants mentioned in Shakespeare's works. It's a popular wedding venue. To find more info and see photos of all the these gardens, plus a map I created showing where to find them, check out Golden Gate Park gardens. 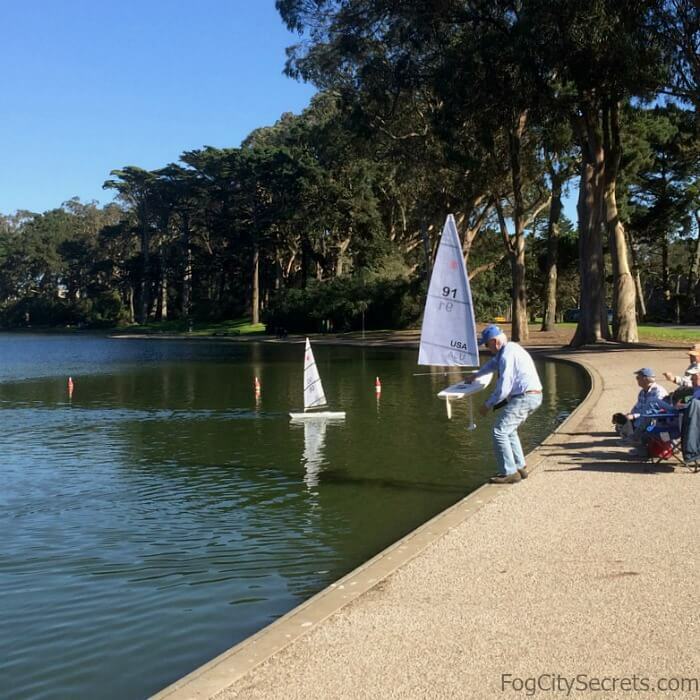 Spreckels Lake is a good-sized body of water, where you can watch the model-boat enthusiasts sailing their yachts. 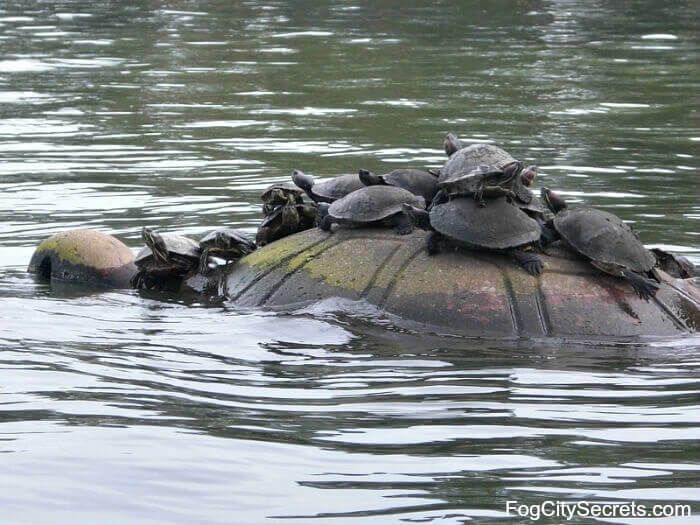 There's a nice walking path around it, and a group of turtles have claimed it as their home (look for them on the turtle sculpture). Named after the Spreckels Sugar family, big donors to the park. 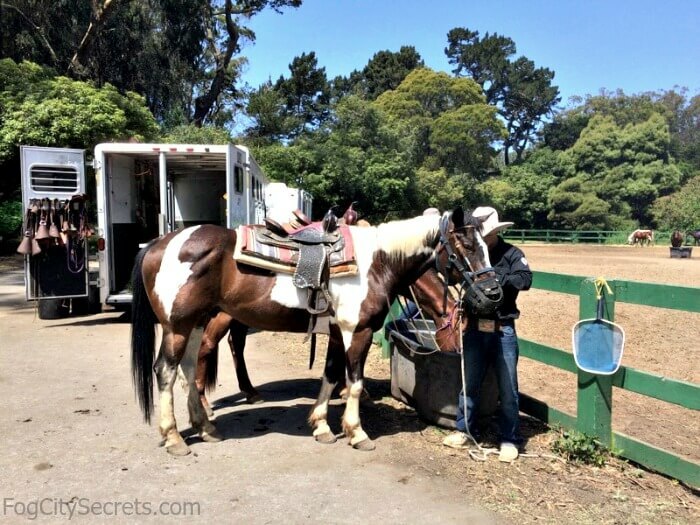 Horseback rides for the public returned temporarily to Golden Gate Park, after an absence of many years! But the trial riding program ended June 30, 2017, and at the moment there is no plan to make it permanent. Unfortunately, there's no horseback riding program in the park for summer, 2018. They were located at the Bercut Equitation Field, a riding ring on the Chain of Lakes Drive in the outer park. See my page on horseback riding in the park for what the ride was like. People can make arrangements through the park offices to bring their own horses there to ride here. 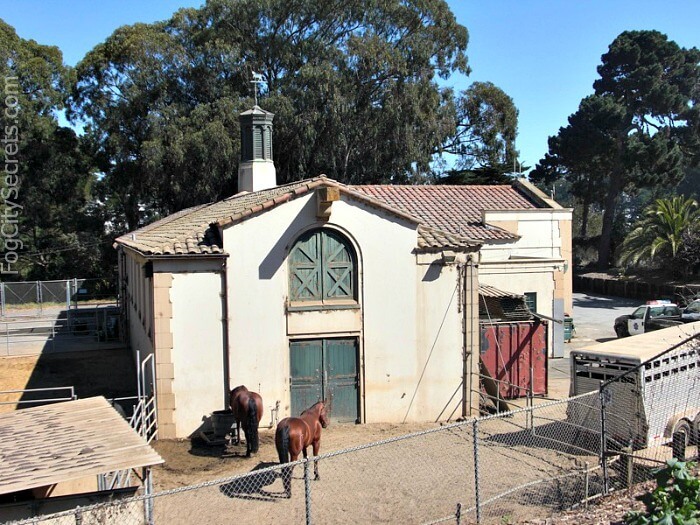 In addition to some horses being privately boarded here, the San Francisco Police Department keeps their mounted-police horses in the park stables and you'll often see the officers riding in the park on patrol. The white gateway with its classical columns, standing alone on the shore of Lloyd Lake, looks like it was constructed in the manner of a romantic, Edwardian-era, faux ruin. But this ruin is genuine and has an interesting past. 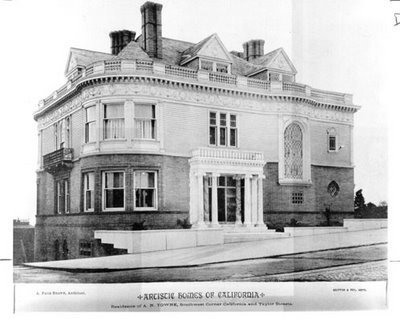 This was originally the entryway of a California Street mansion owned by Alban Towne. The house on Nob Hill was destroyed in the 1906 earthquake and the portal was donated to the park by Towne's wife in 1909, as a reminder of the devastation suffered by the city. The photo above was take by Arnold Genthe, a well-known, San Francisco photographer of the time. His studio, along with many of his photographs, were also destroyed in the fire. 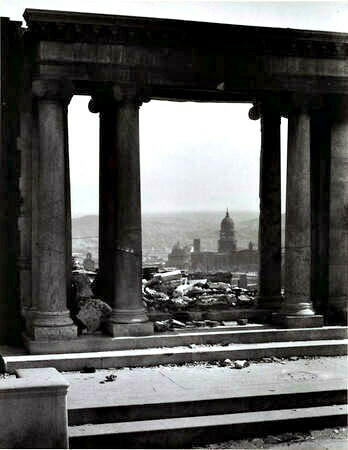 In the distance, you can see the dome of San Francisco's City Hall, also wrecked in the earthquake. Are the lake and the portal haunted? Some say they are. Wraithlike forms and balls of light have been reported after dark! Sir Arthur Conan Doyle (creator of Sherlock Holmes) visited the lake in 1923 because of its spectral reputation, and the lake was mentioned in the Hitchcock film, Vertigo. Golden Gate Park has some pretty waterfalls scattered here and there. A particularly nice one is near the Chinese Pavilion at Stow Lake. There's another tall one on MLK Drive near Stow Lake, and a gurgling low one joins the waters of Portals of the Past, a neoclassical structure on Lloyd Lake. Rainbow Falls, a waterfall on JFK Drive near Transverse Drive, marks the location of the hidden Prayerbook Cross. Take the path to the right of the pond and up the hill, and you'll come to a huge stone Celtic cross, the Prayerbook Cross. This was donated by the Church of England in 1894. 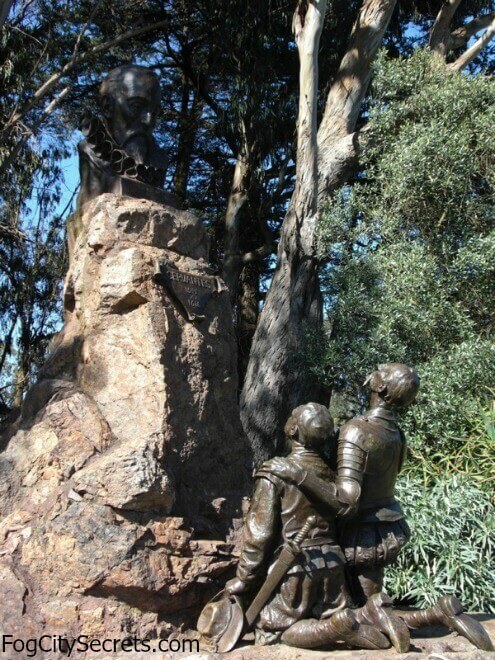 Some speculate that it was allowed to become hidden by vegetation to protect it from the political scrutiny that befell the large cross on Mount Davidson. 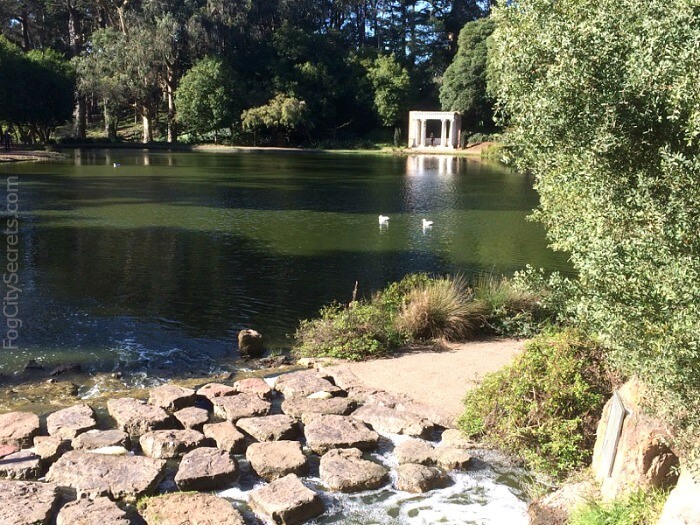 There are 10 lakes in Golden Gate Park, plus various ponds, all man-made except for the three in the Chain of Lakes in the western part of the park. Stow Lake is the largest. All through the park you'll find statues. Many famous subjects, plus some unknowns, are placed here and there, often partially hidden by shrubbery. A tribute to Cervantes is near the de Young Museum, and Beethoven is seen frowning near the Academy of Sciences. Keep an eye out for the artists, poets, composers, baseball players and some cool animals decorating the park. I particularly like the mountain lion and bear guarding the park entrance at 8th Avenue. And now, a gleaming, chrome pirate lurks near the de Young Museum, behind some bushes near the pond. Even John McLaren, creator of much of what you now see in the park, got his own statue. Kind of funny, because he was outspoken is his dislike of the statues already in his park. They waited until he died to put up his statue. 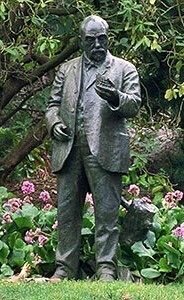 He's standing in an out-of- the-way spot, in the woods by the Rhododendron Dell; fitting, since McLaren used to plant shrubbery to hide the other statues! A statue of Robert Emmet, an Irish patriot, stands in front of the Academy of Sciences. He was executed in 1803 for rebellion against the British. In the Summer of Love in 1967, one area of the park became Hippie Central. The area called Hippie Hill became a favorite gathering place for the flower children drawn to San Francisco... a place for playing music, dancing, hanging out and doing drugs. This is where the Jefferson Airplane, the Grateful Dead, and Janis Joplin, and others, gave impromptu, free performances. Many of them lived in the Haight-Ashbury neighborhood adjoining the eastern end of Golden Gate Park. This is still a gathering place for the 21st Century hippies, or hippie-wanna-be's. On sunny days, especially on weekends, you'll usually find a drumming circle there, and people hanging out on the grass (and smoking it). One of the trees is famous for being the spot where Janis Joplin used to sit and play her guitar. Golden Gate Park has its own herd of bison which live in the park, just off JFK Drive near 43rd Avenue. Wrongly named "buffalo paddock", these animals are North American bison, quite a different species. To be candid, the bison themselves are not terribly interesting (they tend to hang out far from the viewing area and don't move around much). The more interesting aspect is, why is there a bison herd in Golden Gate Park? There have been bison in the park since 1890, when a pair was brought from the Great Plains and donated to the park. 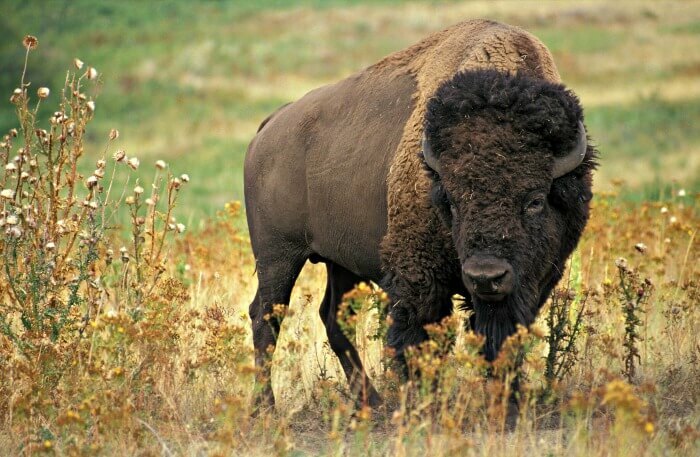 Relatives of the current residents contributed to the rebuilding of the bison population in the U.S. when it was nearing extinction. They can be seen grazing in a large enclosure behind a chainlink fence, on the north side of JFK Drive, near the Chain of Lakes. Apparently they can be dangerous, as in unpredictable charges at 35 miles per hour, but they're in a fenced area and seem very placid. 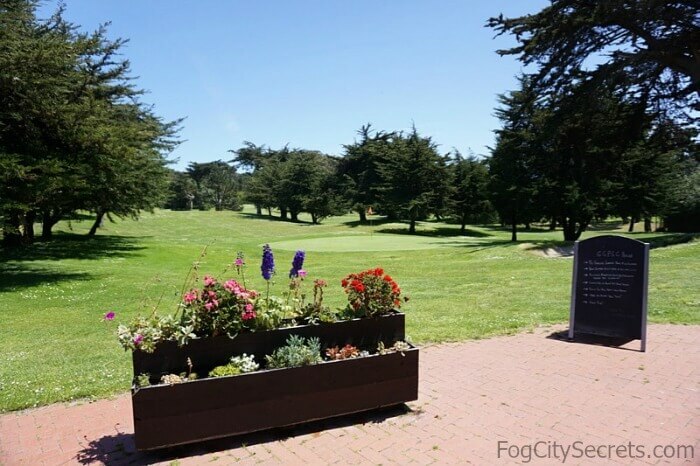 Golden Gate Park is a popular venue for a number of annual events and special events as well. See full calendar of events and details. Shuttle route information (mistake in official map!). Dogs in the Park: off-leash areas and coyote warning. 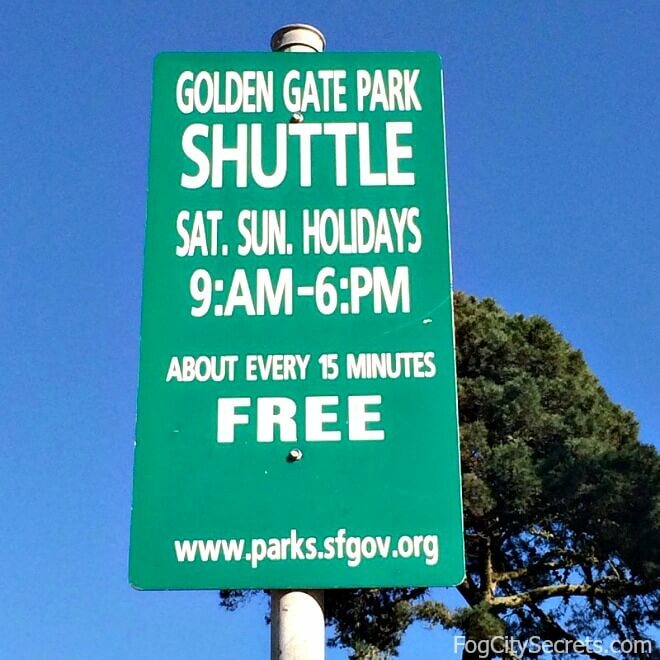 Golden Gate Park runs a free shuttle, on weekends and holidays, from one end of the park to the other, along JFK Drive. The shuttle is scheduled to run every 15 minutes, from 9 am to 6 pm, though it may be more like 20 or 30 minutes in practice. There are pick up points all through the park along JFK Drive (see map below). The stops are marked with a sign. 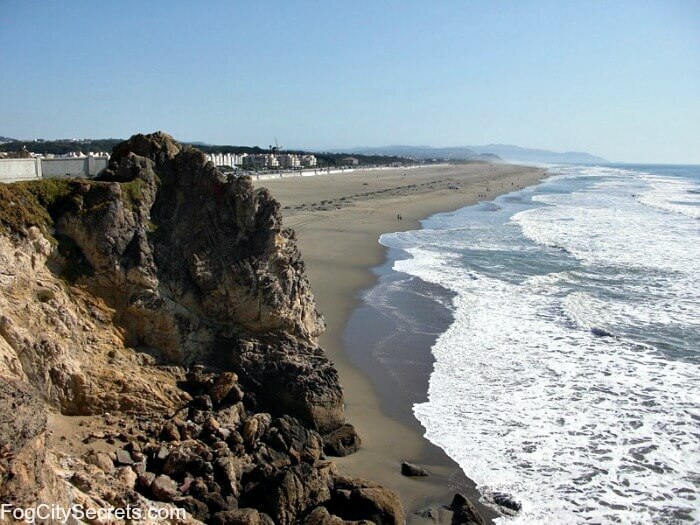 Visitors can park in the free lot at Ocean Beach across from the Beach Chalet restaurant, or inside the park itself, though finding a spot inside the park can be challenging closer to the popular attractions. The Ocean Beach parking lot is big, so spaces should be available even on sunny summer days. 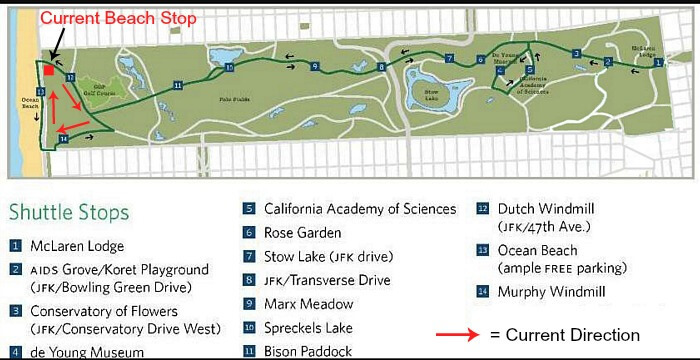 Tip: if the lot is full or you want to park in the park, it's usually not too hard to park along the western stretch of JFK Drive, near the bison paddock, or Spreckels Lake, both of which have shuttle stops nearby (marked on map). But...don't leave any possessions visible in your car when you park in the lot, or anywhere else in the park. Lots of car break-ins here! 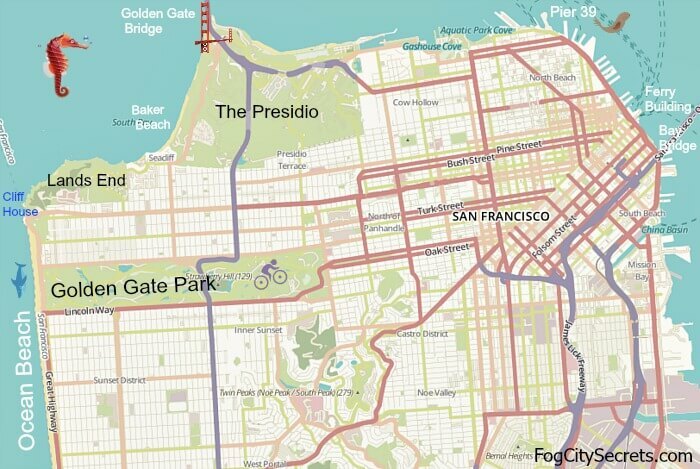 Important to know: the shuttle map on the park website has a mistake on the route near Ocean Beach. The shuttle never stops at the Ocean Beach parking lot! I added the red arrows and correct location of stop. 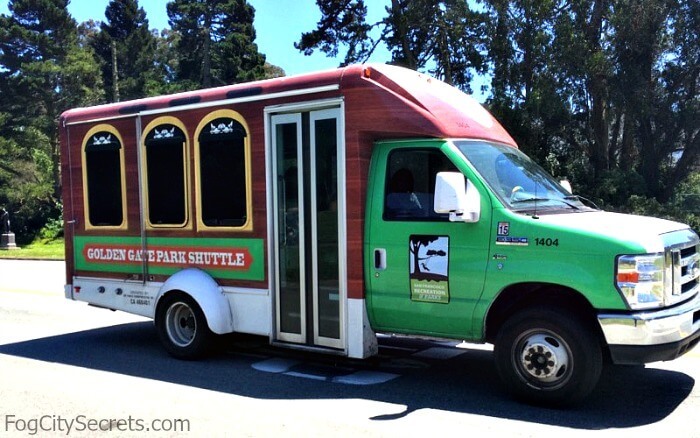 The park website tells you to wait at the green shuttle sign at the Ocean Beach parking lot. And there is a big green sign for the shuttle, but it never stops there! Probably did in the past, but no more. The first time I used the shuttle, I waited at the Ocean Beach parking lot near the shuttle sign for 30 minutes, (and some other people had been waiting there an hour), when we saw the shuttle going in the other direction and stopping across the street! 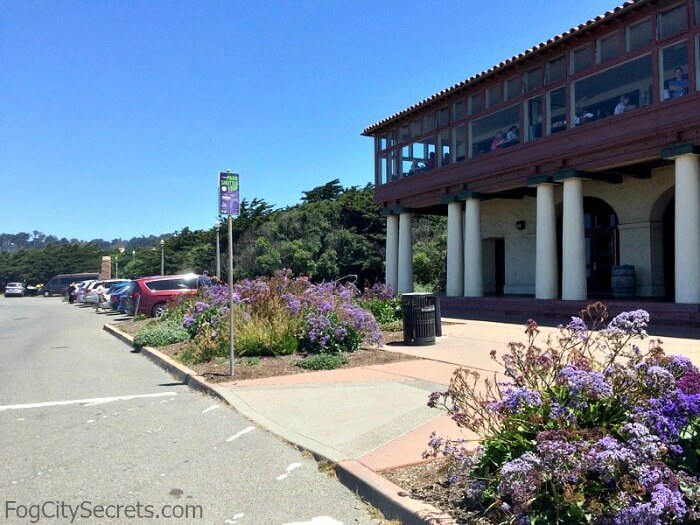 The stop for the Ocean Beach parking lot is actually on the other side of the Great Highway, in the parking lot of the Beach Chalet restaurant (which also has a shuttle sign). Golden Gate Park is a popular place for locals to bring their dogs for exercise. Dogs are required to be on leash, except for a few designated off-leash areas. Coyote warning: coyotes have attacked dogs in the park, even large dogs on leash, so keep a look-out if you bring your dog here. Be especially careful with small dogs off leash; several have been snatched by coyotes right in from of their people. 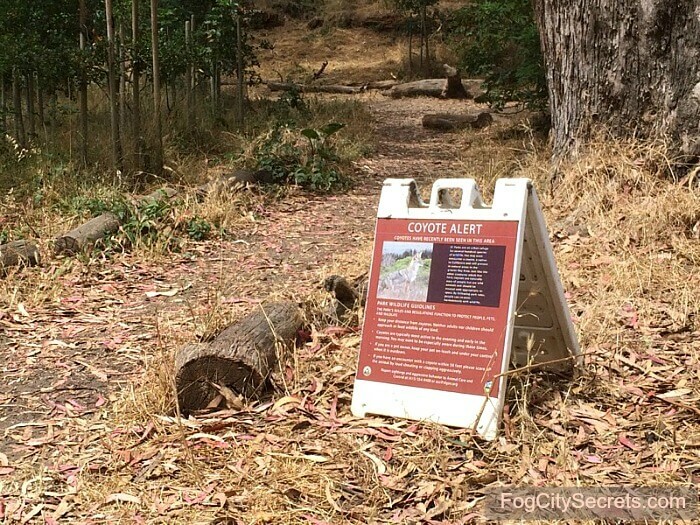 The park staff have started putting up notice boards where coyotes have been seen recently, but they live in the park, so they could be seen anywhere. Coyote attacks on humans are extremely rare, so it shouldn't be a worry for visitors to the park. I'm in the park a lot, and I've never even seen one there, but many people have. If you see one, act bold and make noise. Don't approach them. They're mostly active around dawn and dusk, but they're often seen in the daytime, too. The stretch of JFK Drive between Kezar Drive to Transverse Drive is closed on Sundays year round, and also on Saturdays from April through September. 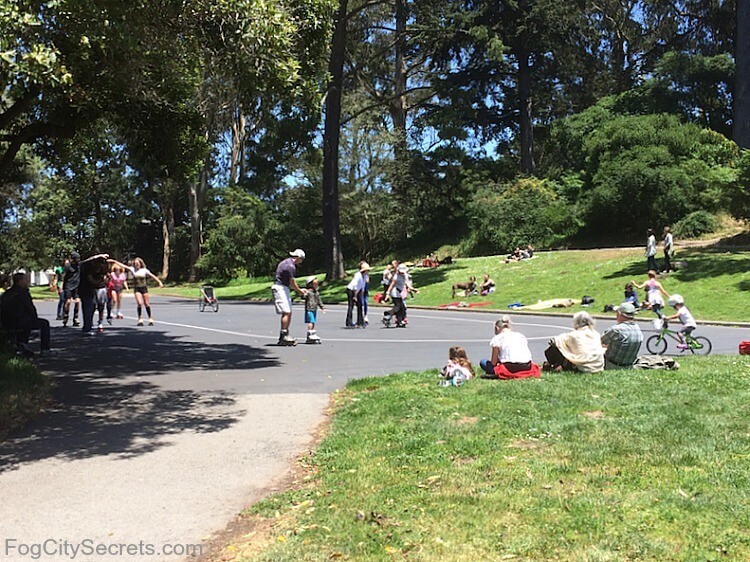 This provides a perfect, auto-free area for cyclists and skaters to sail up and down the park, past the Conservatory, de Young Museum, and the Rose Garden. The park shuttle is the only vehicle allowed in there then (plus occasional park maintenance vehicles). 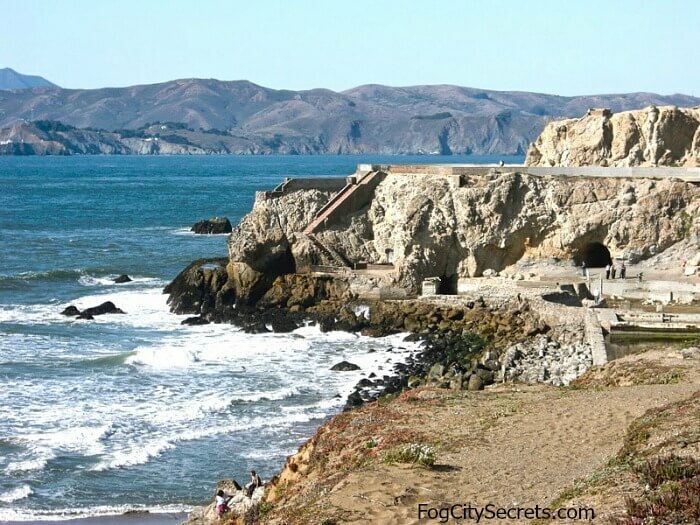 San Francisco was booming after gold was discovered the hills in 1848. The small village of Yerba Buena mushroomed from 200 people in 1846, to over 56,000 in the new city of San Francisco by 1860. The San Francisco numbers kept on climbing, and it was clear that the urban residents needed a park. In 1868, the city government set aside an area in the sparsely-populated sand dunes in the western part of San Francisco, known as the Outside Lands (now the Richmond and Sunset Districts, and the name of a popular annual concert). It was a rather desolate, wind-swept area, with very few people, and wasn't considered very valuable real estate. It still has the grayest and windiest weather in San Francisco, but the real estate is no longer cheap! The intention was to create a natural-looking park, with rustic bridges and winding roads and pathways. The biggest problem was getting plants to take root in the sandy and windy conditions. Eventually the gardeners won, and the lush, green park took hold. A streetcar line ran out to the park making it easy to get out there, and it became extremely popular with San Franciscans. The park almost didn't happen. In 1876, some of the local millionaires (including Leland Stanford) tried to take over the area to build a racetrack, but after a power struggle with the Park Commissioners, the original plan for a park was reinstated. John McLaren, a Scottish landscape architect, was most responsible for the appearance of the park today. He lived in McLaren Lodge in the park until 1943, when he died at 96. Beach Chalet. Nice restaurant with great view of the ocean, at the western end of park on the Great Highway. Cool WPA murals. de Young Museum. Restaurant in the museum has good food; you don't have to pay the museum entry to eat there. Academy of Sciences. Three restaurants inside (have to pay entry), good food. Food trucks behind the Band Shell on the Music Concourse. Less expensive. Stow Lake. Snack bar has burgers, hot dogs, salads, etc. Japanese Tea Garden. Selection of Japanese treats. Carousel and Golf Course have snacks. During summer, there are little snack kiosks along JFK Drive. Near the Park. Just outside the park entrance, at Lincoln Way and 9th Ave, is a great neighborhood (Inner Sunset) that has a cluster of good restaurants. Park Chow. Tasty, comfort food. 1240 9th Ave.
Pomelo on Judah. Excellent Asian fusion. 92 Judah at 7th Ave.
Nopalito. Good Mexican food. 1224 9th Ave.
Arizmendi Bakery. A local favorite. 1331 9th Ave.
New Eritrea. For something different. 907 Irving St, at 10th Ave. The 5-Fulton bus runs along Fulton Street, along the northern edge of Golden Gate Park. You can catch it on Market Street, downtown. See live map (stops and bus locations): 5-Fulton. The N-Judah Muni streetcar runs along Judah Street, parallel to Golden Gate Park and two blocks to the south. You can catch it under Market Street (subway downtown). See live map (stops and car locations): N-Judah. There's lots of parking on the roads throughout the park, but it can get congested in the area near the museums and Tea Garden. You should be able to park within walking distance of where you want to go. Parking is free on the streets in the park, but some of the main roads have four-hour limits (check for signs). Note: there have been lots of car break-ins in the park lately, so please don't leave anything in view; no bags, backpacks, jackets, etc. Parking Shuttle. There is a free parking shuttle that runs along JFK Drive on weekends and holidays, from 9 am to 6 pm. See map above (the official one has a mistake on it). Ocean Beach Parking Lot. There is a huge, free parking lot at the far western end of the park at Ocean Beach. You can catch the shuttle at the stop across the street from the parking lot, in front of the Beach Chalet Restaurant. See important info about the shuttle above. The Legion of Honor in Lands End is a wonderful art museum. Lots of beautiful European paintings, and more, in a gorgeous setting.